Commercial cleaning services offered in Maryland, DC, and Virginia, customized to specific needs for different commercial establishments of all sizes – both big national companies and small independent businesses and offices. We tailor our office cleaning services to your individual requirements, needs, frequency, and circumstance. Located in Bethesda, Maryland, we are trusted, reliable, punctual, and prompt, a client-orientated cleaning company. The satisfaction of our clients (just to mention some of them: Cybertek School, Next Day Cabinets, and Parallel Travel) with our office cleaning services testifies that you won’t be able to find more dedicated, professional, detailed, on-time, and reliable commercial cleaning company than Maids Prime. Regardless the nature or the size of your business and company, Maids Prime will set your mind at ease and take care of all the challenges that your regular cleaning may not be able to handle adequately. Regular wear and tear, grime, grease, odors, and moisture are typical problems that can bring any commercial endeavor to its knees. We handle these cleaning tasks better and quicker than anyone, so you can be sure to come into the cleanest workplace every day, without worry. When corporate offices in Maryland, Virginia, and DC areas choose our commercial cleaning services, they put a lot of faith in Maids Prime. We always make sure to award their expectations by providing a consistent, high-quality level of care and cleanliness, and keep their offices look sparkling clean. However, we will be happy to customize our commercial cleaning services to your specific needs. Contact us to Book Cleaning Services. Maids Prime Cleaners are well-trained. This is why our dedicated and professional crew of cleaners always deliver the highest standards in their service. Our cleaners are all personally interviewed, checked, and licensed. We equip them with the appropriate experience, knowledge, and skills to serve our clients better. Maids Prime maintains the highest level of commercial cleaning services through rigorous and regular training. We Give 100% Customer Satisfaction Guarantee. Here at Maids Prime, we measure our success by the success of our clients. This is why we made clean, healthy office space our mission. We truly believe that only clean, pristine working space boosts productivity and results, and attracts new clients. Our 100 % Customer Satisfaction Guarantee sets your mind at ease and lets you enjoy your working space. We Customize Our Services to Your Needs. When do you need professional cleaning help? Do you need us as typical janitorial help daily, weekly, bi-weekly, or monthly? Do you need a day or a night office cleaning service? We are proud to say that we can meet all your needs and deliver top-notch commercial cleaning services whenever you need us. You can also contact us if you need a professional cleaning help for a specific reason, before or after a move or a renovation. We will be happy to help! Our cleaning service will be just as thorough as when we clean on regular basis. We Give the Lowest Commercial Cleaning Prices in the Market. We determine our commercial cleaning services price by several factors, such as how often you require our office cleaning services and the square footage of the office or other commercial space you want us to clean. Contact us now to get a free quote. If you’re busy and on the run, give us a quick call at 202-808-1166 to check out our estimated pricing. We guarantee that you’ll get the best deal on commercial cleaning services in Maryland, DC, and Virginia. Stop thinking about tasks you shouldn’t think about and start enjoying all the benefits of a perfectly clean and fresh office space. All commercial cleaning services plans will depend on what specific client needs. 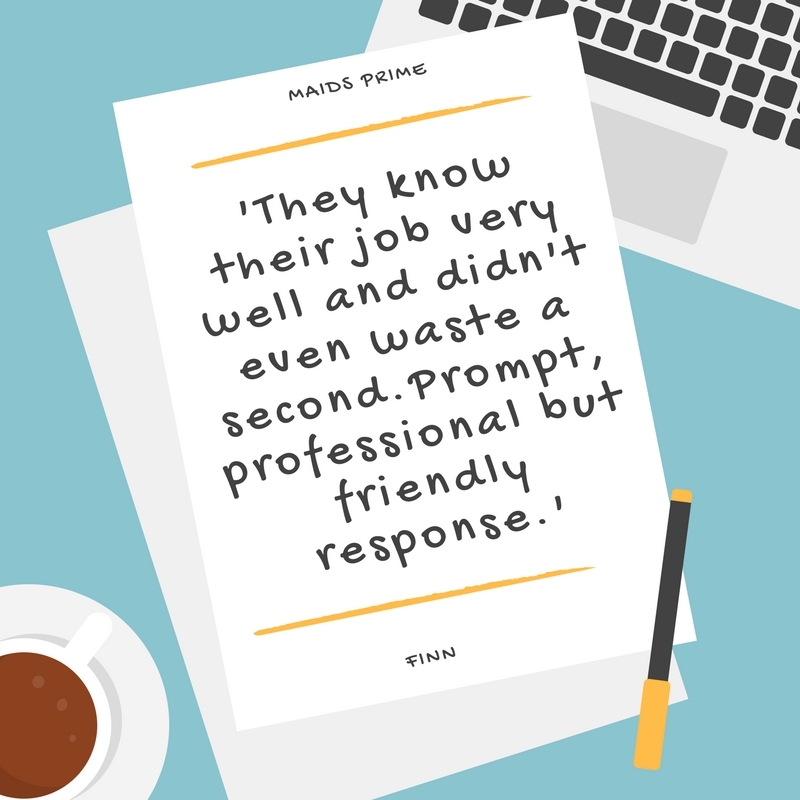 Maids Prime will provide you with a quote for each area of the workplace with a detailed description of the cleaning to be performed and how often it will be cleaned. If you hire our cleaning crew for our one-time cleaning service, we will also provide you with a detailed description of the work to be performed. We will come only when you are completely satisfied with the job order and the price. Maids Prime cleaners will perform the work as described in the work order, and probably more. We won’t leave your premises until you’re 100% satisfied with our work. 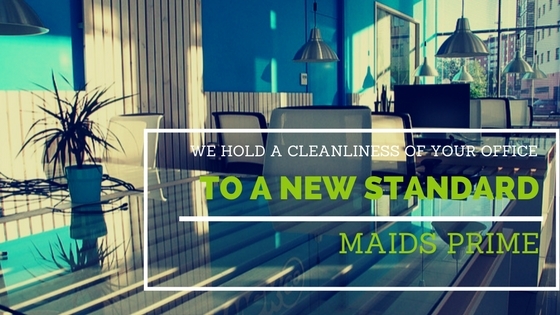 Maids Prime carefully vets all the cleaners before deploying them to your place of business. We make sure they are experienced and professional in commercial cleaning, and speak English to avoid miscommunication. Check their identity, background, and references, interviewing them in person, and sending only those that have been highly rated by other Maids Prime customers, are our routine processes. If you happen to have any concerns about our professional cleaning staff, all you have to do is give us a call. We are always available to answer your questions and resolve your issues. To make it even safer and more secure, we make your payments cashless and after one-time cleaning. You only pay after our cleaning crew is done and after you have had a chance to inspect the work. You can pay via credit card onsite. Maids Prime office cleaning services provide a full complement of office cleaning services for businesses, corporations and companies of all sizes located in Maryland, DC, and Virginia. Our low monthly rates, a state-of-the-art customer service, a wide scope of cleaning tasks we perform, and customization options we give, made local businesses trust us. Maids Prime is recognized as one of the top commercial cleaning services companies not only in Bethesda, MD, where its headquarters are located, but also in the greater Maryland, DC, and Virginia area. Contact us today to get a cleaning your company deserves.